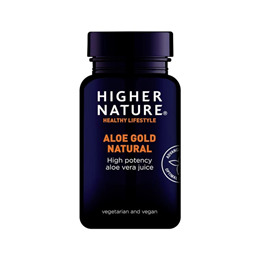 This is the most potent Aloe Vera available in Europe, made from fresh, organically grown, whole leaves, using gentle technology that extracts up to 20 times more vital nutrients (and not reconstituted from powder, like most Aloe juice and gels). Aloe Gold provides up to 18,000 MPS (polysaccharides) per litre; few aloe juices provide more than 1,500! Unlike most products, Aloe Gold is not reconstituated from powder. 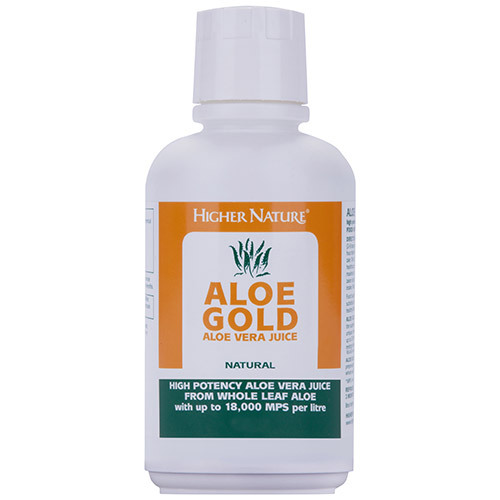 In Aloe Gold water is extracted, not added. It is flash pasteurised and protected with gentle natural preservatives. Aloe Vera products which claim to be preservative free are usually cooked, destroying most nutrient value. Aloe is rich in sulphur and 200 other nutrients. It is classified as a digestive herbal bitter, helping to maintain healthy digestion, release of bile, and optimising absorption of nutrients from other foods. Certified organic whole leaf Aloe Vera (Barbadensis Miller) Juice, citric acid, natural food grade preservatives: sodium benzoate and potassium sorbate. Take 2-6 teaspoons (10-30ml) daily in juice or water. When desired a maximum of 16 teaspoons (240ml) may be taken daily (adults). Below are reviews of Organic Aloe Vera Juice - 1000ml by bodykind customers. If you have tried this product we'd love to hear what you think so please leave a review. This is the most potent Aloe Vera available in Europe, made from fresh, organically grown, whole leaves, using gentle technology that extracts up to 20 times more vital nutrients.